Washed rind cheeses mature similarly to traditional surface ripened white mould cheeses – from the outside in, but the development is from bacteria rather than moulds. The type of natural bacteria used is called Brevibacterium linens, or B.linens for short. During maturation these cheeses are regularly washed with water or brine which can contain wine or beer, herbs and spices or annatto colour. 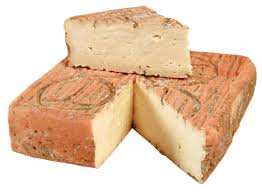 Washed rind cheeses are often described as being meaty or yeasty. They can be very strong in aroma and almost reminiscent of a barnyard smell.